Originally bathrooms served strictly functional purposes in our homes. Today, they are equally as beautiful as they are functional. Every design detail involved in bathroom design plays an important role in the overall space. Today we are discussing trends in shower design. The use of marble in showers has and will always be a luxury, giving the shower a spa like feel. From slabs to mosaics, the style keeps coming back year after year. Marble is an excellent stone for many reasons, one being its ability to fit in stylistically anywhere from a traditional to a modern design. With thousands of options on the market, how do you choose just one? Rain head showers have been popular in the market the past few years. This Kohler HydroRail featuring a Katalyst rain head and shift hand shower, transform the standard single outlet shower into a spa-worthy shower. This show stopping classic art deco inspired faucet from Kohler is great for any bathroom. When paired with Rite-Temp pressure balancing valve, your shower maintains your desired water temperature during pressure fluctuations. No more cold showers! Select a neutral tile in an unexpected shape. These arabesque tiles are an updated ode to old world style while remaining fresh and current. 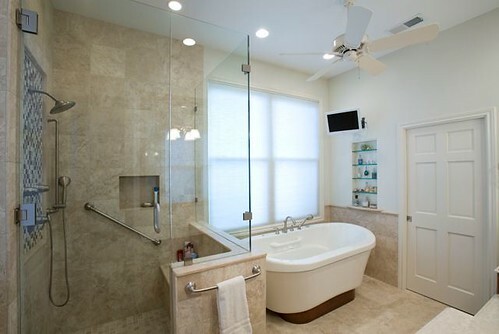 They give the shower interest but maintain a light, clean and airy feel. We sat down with Brenda and Gina of Kitchen Comfort, a Kitchen & Bath Showroom and Design Firm located on charming St. Clair Ave. in St. Paul. Nestled between homes built in the the early 1900’s the location couldn’t be more fitting! Gray is everywhere! From cabinet finishes, tile, wall color, floor coverings. Gray is having a very strong presence in the design world. Check out these gray bathrooms. While fashion matters, by an large people seem to be focusing on products that are easy to clean, use and live with. Eliminating time spent cleaning and maintaining and more time with family, enjoying life. Thanks Brenda & Gina for the great information. Check out more of Kitchen Comforts work here!